The morning of Saturday, March 25th, the campground in Afton Canyon Natural Area was full of excitement. 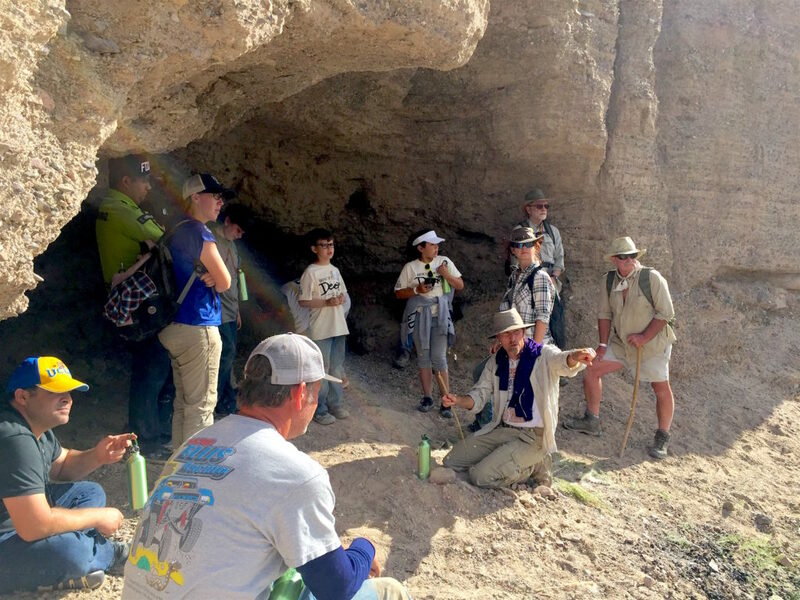 Staff from the Amargosa Conservancy, BLM, Sierra Club, and Leave No Trace completed final preparations for the arrival of the campers. 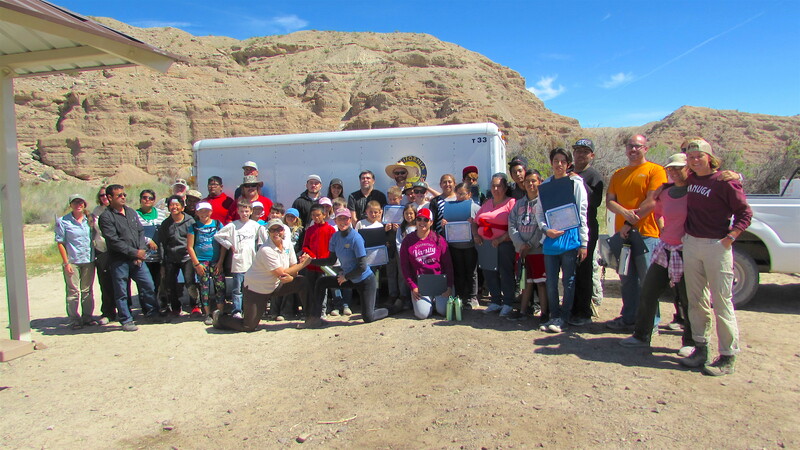 We were hosting a weekend of camping and conservation activities for a variety of groups. 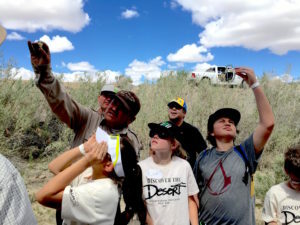 Among the groups were the Junior Rangers, conservationists in training from Barstow, ranging from ages 8-13. Two family groups representing the Council of Mexican Federations (COFEM) also came out all the way from Coachella valley to participate in the weekend’s events. 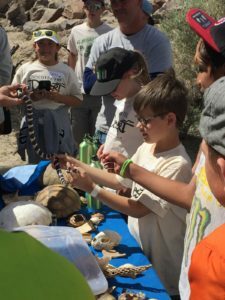 We kicked off the weekend with an Afton Canyon sign unveiling while the BLM distributed brand new shiny green reusable water bottles to all the campers. Next we we set up tents. The wind was going crazy and made for a very interesting hour of set up. I could tell that participants were innovative as they collected large rocks to help hold the tents up against the wind! After the tent trickery was over we transitioned into lunch and then split up for activities in four different stations. My group was very antsy so throwing them into a wetland area and letting them get down and dirty in the mud was a great way to kick off the activities! We learned that willows can regenerate from just a single branch. During storms and floods branches will break off and lodge themselves along stream beds and grow into a new willow tree. We sped up this process and planted a few “future trees” each. My partner for the day was Evan, an energetic and enthusiastic 8 year old who was basically a willow planting professional. By the end of our first planting both Evan and I were covered in gray mud up to our elbows, with splatters on our faces and in our hair. There was a lot of laughing and Evan kept reminding me that we had to “get rid of alllllll the air pockets so our willows would grow up to be the tallest”. Earlier in the week the LNT crew had met with the Junior Rangers and the BLM staff at the Desert Discovery Center in Barstow and worked through some LNT activities. Donielle and Aaron did a great job teaching them hand signals that corresponded to all 7 LNT principles. 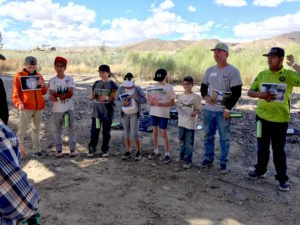 Since they were newly experienced in Leave No Trace ethics, the kids were happy to shout out answers, talk about the importance of these practices, and participate in LNT a trivia game. Comparing decomposition rates of various types of trash. 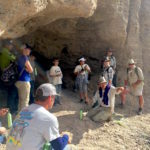 A hike through the Canyon with Tom and the BLM interns gave a descriptive history of Afton Canyon area. 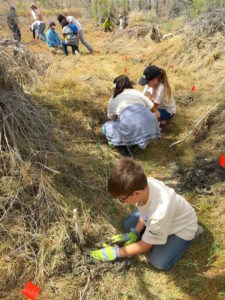 We learned about changes in the landscape, history of Native American tribes as well as current flora and fauna. The hike also presented an opportunity for kids to run around and do some exploring of their own. From the moment we walked up all the members of our group had both eyes and hands roaming over the items in Arts’ nature collection. Skulls, specimens preserved in vials, bones, snake/lizard sheds, taxidermy birds, feathers, and even a few live animals were spread out on the table. “I just want to make you into the best scientists and naturalists you can be!” Art exclaimed right from the start. He let the kids choose what they wanted to learn about and form hypotheses about various items. He made all the samples, including live reptiles, tangible to anyone who dared! Among crowd favorites were the giant female scorpion, the Chuckwalla, a live California Kingsnake, and the educational briefing on the effects of litter on ravens and desert tortoises. Litter, he told us, could be mistaken by the tortoises for food. They eat a lot of flower material and are attracted to bright colors. When they are enticed by colorful trash they go out into the open, usually where ravens have been hanging out looking after the same trash. Ravens are opportunists and we eat almost anything that’s out there – including tortoises. It’s a bad cycle that can easily be stopped by picking up trash we see in nature and making sure that we recycle our own waste product as well. Another interesting aspect explained how the proteins in Scorpions cause it to glow a neon green under a UV/black light. These proteins have become increasingly beneficial to the medical field through injections used to locate, treat, and remove tumors. These medical benefits show further importance for conservation and study upon the scorpion, and can serve as an example of the importance of species protection in general. After stations wrapped up, we played games, ate snacks and had a great dinner. The next order of the evening was to go on a hike after sunset. After much anticipation it was finally time to gather flashlights, UV lights and follow Art off into the night to find bullfrogs and scorpions. We watched as Art caught a large bullfrog with ease, and we discussed the biology and invasive nature of some species in the Afton area. On the way back to camp we located a small male scorpion, glowing bright under the UV light. Art picked it up – much to the campers delight – and told us all about it. Later on back at camp, a few of us were lucky enough to have an inspiring conversation with Art that turned into the highlight of my weekend. Art shared stories with us about his family and their love for exploring – most recently their adventures focused on night time explorations. “The desert is so different at night. It’s a whole new world out there when the sun goes down!” He was pouring out love and excitement for the natural environment and it captivated all of us. 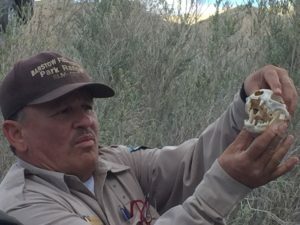 He talked about his role with the BLM as a Park Ranger and some projects he had been working on. In his job, he leads a lot of informational programs with kids. While he loves the enthusiasm of the children and their ability to soak up knowledge like sponges, he had recently made a new discovery. “I think I want to focus more programs towards parents and adults. They love learning the science behind nature, and they have the ability to pass this on to their kids, and be the ones to take them outside”. While kids love learning about the outdoors, they typically can’t take themselves off on adventures alone. By collaborating with the parents, Art hopes to help increase interest and knowledge for the natural environment. I thought of a moment from earlier during our station at his nature table: “Do what you love, find your passion, then you can be like me: I’m lucky enough to work out here!!!! I get to come out here and explore the best places for my job, everyday!” He was smiling wide and gesturing to the surrounding stream, mountains and canyon. Every interaction with Art was educational and inspiring. As I looked around the group I could see I wasn’t the only one who felt this way. Sunday morning I got to run a reflective exercise, pulling together all we had learned from the weekend and providing the opportunity for people to express their feelings towards all of the events. 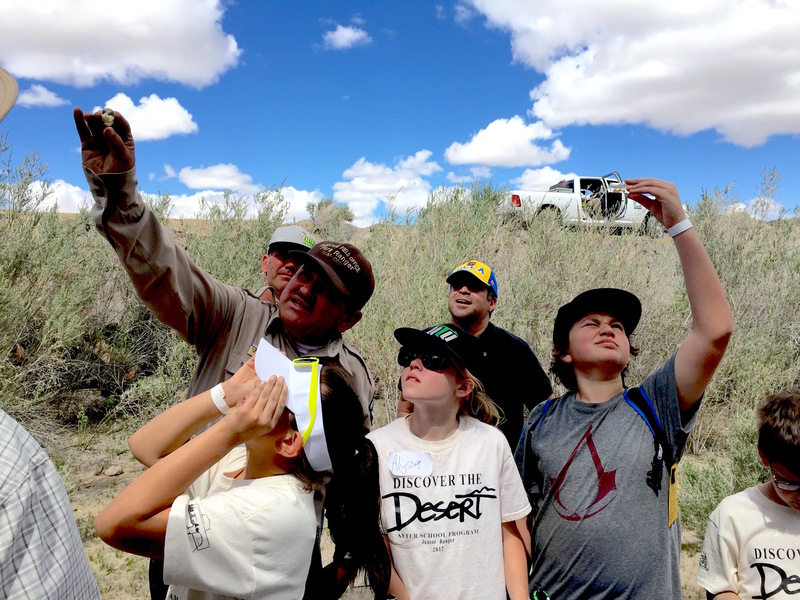 During this period, the kids stated time and time again examples from Art’s nature collection and the guided walks as favorites from the weekend. They could recall an impressive amount of facts that they learned. Besides all the knowledge the kids were throwing my way, a reflective moment with John, one of the parents, solidified the success of the campout.